Conference club Eastleigh have decided to offer free entry for Tuesday's home match with Dartford. The cheapest adult ticket for a league game at Ten Acres would usually be £12. Chief executive Mark Jewell told BBC Radio Solent: "This is the second year that we've done this type of thing. We've seen our season tickets grow. "We just hope that, if we get an extra couple of hundred on the gate, a decent percentage of them would like to come back and revisit us in the future." The Hampshire club already offer the cheapest match tickets in the division, according to the BBC's Price of Football study. 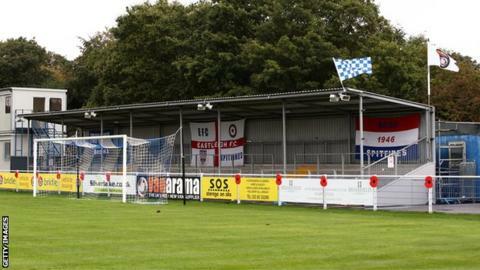 Eastleigh were also found to offer the cheapest season ticket in the top five tiers of English football, priced at £105. "It's a great atmosphere here," Jewell added. "It's a cracking little place to come and watch football. "When we have promoted games, the fans have responded, the town has got behind the team, and we had over 2,000 people here for a midweek game against Forest Green recently. "We're trying to grow the brand of Eastleigh Football Club and we'll continue to do this until we get the ground absolutely full." Newly-promoted Eastleigh currently lie 11th, six points off the play-off places but with three games in hand on fifth-placed Macclesfield.